Yes, I have been traveling, but I have also been swamped with work, which happens a lot when traveling. But besides these factors, I just don’t want to be repetitive about what is going on in Venezuela. Everything just seems to be going downhill non stop. But if I thought I had heard everything about corruption, today the Minister for Sports tells us that her signature was faked in sixty files to request foreign currency for traveling sportsmen. Amazingly enough, a single “athlete” was given US$ 66 million over a period of a year and a half, according to the Minister. What this says is that there is simply no control anywhere in Venezuela. If a single (and lowly) Minister’s signature can be faked and someone can obtain US$ 66 million illegally, imagine what a Minister of Finance or a Minister of Energy can sign for without anyone checking! Even worse, is the ethical deterioration in that Ministry and among the “athletes”, including the Minister. Because she wants to protect the names of the people involved in order to “respect them as athletes”. These are people that faked signatures, newspaper clippings, trophies in order to rob the Venezuela people and she wants to respect them? The only respect they deserve is jail. And the Minister should be fired for allowing this to happen. And the Comptroller of the Ministry too. This is simply an insult to the average Venezuelan who is given a few hundred dollars after dozens of requests, checks and the like, while the Bolideportistas and the Boliestafadores can get anything they want. If Maduro wants to fight corruption, the first thing he will have to do is fire everyone around him and try to find someone within Chavismo that is still honest, which may be a tall task in itself given the immorality that this news represents. Anyone that thinks they understand the sudden moves made by Nicolas Maduro during the last few weeks, should wait a while, because I don’t think the full picture is clear yet. What I do think is clear is two things: Maduro is not happy the way things are going, he knows his Government is not working well and the importance of Nelson Merentes has been substantially diminished. In fact, Merentes’ slide seemed to begin earlier than two days ago, when in a puzzling move, Maduro failed to include him in his bombastically-named “Organo Supeiror para la Defensa de la Economia (OSDE)” , which was created on the last day of September and is presided by a General, whose power has been increasing, but despite its name, failed to include Merentes. This discrepancy was noted at the time, but nobody knew exactly what it really meant. Merentes is clearly paying for his lack of accomplishments. The man that was supposed to be the “pragmatic” member of Maduro’s Caibent, was not energetic enough to push his agenda and the more ideologically minded members of the Cabinet managed to slow down all of his initiatives and Merentes has essentially nothing to show for his almost six months in the Ministry of Finance. The second sudden move, was the removal of Maduro’s confidant Temir Porras from both the development bank Bandes and the development fund Fonden. 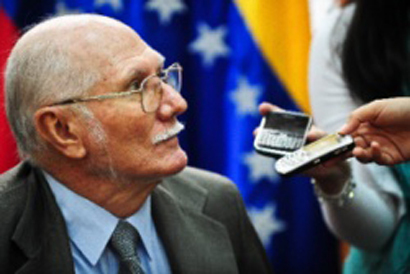 Porras was a new figure in the economic side of the Government and had been reported to be Maduro’s sounding board on economic and financial matters. But faster that you could say Temir, he was pushed out last week with no explanation. And there is still no clear idea of what happened there, even if some suggests that Porras was removed due to Maduro’s displeasure with the French intelligent services pulling off the operation that allowed them to catch the drug in the Air France plane. Reportedly Porras’ inability to know about this forced him out. Others suggest that Porras’ team convinced Maduro that the Chinese would lend him the US$ 5 billion in cash, which did not happen. Then this week, Merentes was removed as Vice President for the Economy, a position that is now occupied by the Minister f Energy and Mines and President of PDVSA Rafael Ramirez. This position is not that important, but there is a “Revolutionary” Cabinet above the crowded Cabinet, which is composed of six Vice Presidents. This supra-Cabinet meets more often with Maduro and is supposed to have a coordinating role. Ramirez being the new Vice-President for the Economy may not be so bad as many think. He is considered to be part of the more ideological and radical branch of the Government, but he has shown in the past that he can be quite pragmatic. In fact, the only area where there have been some positive signs since Maduro took over has been in PDVSA’s flexibility, which has been led by Ramirez. Ramirez may actually be more capable of convincing the radicals that some change is needed. The problem is that Ramirez is no economist and the change needed is more than a foreign exchange system, like Merentes seemed to think. What is needed is a larger adjustment of the economy and its variables, before distortions gets further out of hand. Ramirez will certainly not deliver that. Caracas is full of rumors and among them, the possibility that Ramirez may also be moved sideways is one of them. PDVSA is where the money is and some Madurista groups may be trying to get closer to the honey pot and the Royal Family having a bigger influence there. As for General Hebert Garcia, he now occupies three positions, the one in the supra-Cabinet, the President of Mision Vivienda and the President of OSDE, signifying that Maduro trusts him and he is the point military man to organize the economy and reduce shortages and build housing. Sounds like a tall order for a single person, let alone a Venezuelan General. But as PMB comments today, there seems to be this belief in Chavista circles that the military can organize things despite fifteen years of proving the contrary. So, stay tuned, Maduro may yet make other moves pronto, which will allow us to better understand the ones he has made, excluding how he fell from that bicycle. Nothing can illustrate better the lawlessness, irresponsibility and lack of equality that currently rules Venezuela that this item from the international news, accompanied by this item today. First, we hear that the official (funcionario) from the National Institute for Sports (IND) was not involved in money laundering. It was not money laundering, because the guy was authorized. Never mind the law, whether Bulgarian or Venezuelan laws. Because in both countries, you have to declare cash above a certain amount. According to this website, you have to declare above 8,000 leva in Bulgaria, whether you are importing or exporting them. That is about 4,000 euro if you were wondering. So, if Mr. Funcionario Official was carrying euro 407,000, he was money laundering, violating Bulgarian law, whether the Embassy likes it or not. But incredibly, these “funcionarios” from the Bulgarian Embassy forget that we live in Venezuela, where you have to declare over US$ 10,000 when you leave the country. If you don’t, you were also money laundering. A country where anyone, anyone “normal” of course, has to fill out and hand in folders to Cadivi, to obtain approval. We are talking about all sorts of forms, filled out individually, to get no more, that is the regulation, than US$ 3,000 in your credit card for travel abroad. Legally, there are no exceptions to these rules. It’s the law of the land. Except Chavismo seems to believe that the law only applies to everyone else. Particularly for non-Chavistas. But really, do you trust a “funcionario” to carry that much cash in a country where nobody can carry cash in foreign currency? Who supervises handing out the cash? Spending it? Really, please…. But really. Think about it. In the country of controls, where to get even small nominal amounts, you have to submit folders, prove you are alive, got to the bank two or three times, get a ticket, get receipts, use only your credit card, except for small cash amounts, but some flunky is given over half a million euros to “carry”, like a drug mule, through the Maiquetia airport, the airport where you can get drugs out, only if you are exporting over a Ton a time, but not smaller amounts. But just like you can not export drugs, it is illegal to export large amounts of cash, even if you are a Chavista. Except it seems as if cash is king for Chavistas. Remember Antonini? He was also above the law. But somehow for Chavismo, it is one thing to be a member of PSUV, a Chavista, or you and me. This Government is all about discrimination. This Government is all about creating two classes of people. It is about having laws that apply to others, but not to you. Because they are the all powerful Government. Except Bulgaria is not Venezuela, the same way that Argentina was not Venezuela, even if Antonini’s plane was chartered by PDVSA. And these are the cases in which they get caught, imagine how many there are where nothing happens. Nobody gets caught. A million euros, two million euros? For Chavismo, the sky is the limit. I mean, the country does not even have a Comptroller, just some flunky who is a member of PSUV and nobody knows her name. (I think it is a she). Becuase Chavismo does not one to appoint anyone who is not loyal to them. Nobody is watching, Bolichicos y Bolichicas, take advantage of it. Meanwhile, pendejos y pendejas (Buddies of mine). Fill out your forms. Hand in your folders. Travel. Spend you money wisely and legally. Hand in your receipts. Get ready to be suspended. Remember you are second class, even if you comply, they may still jail you. You are guilty until proven innocent. You are just not a Chavista, sorry! Americo Da Grazia, the opposition Deputy from Bolivar State, the same one that was pushed down the stairs of the National Assembly a few months ago by a group of Chavista Deputies, gave this excellent speech during the discussion to approve a resolution backing Maduro’s decision to expel three US diplomats. Da Grazia is a member of Causa R, the Guayana socialist party associated with the union movement. -What a pity that this assembly refuses to discuss Venezuela’s problems. -Pity you don’t care about what Venezuelans care about. -We are not lackeys of the gringo empire, but we are also not lackeys of the Chinese empire. But you just gave away the Las Cristinas gold mine to the Chinese empire while on your knees. Shame on you! -You also gave Guyana (the country) the disputed territory. -You dont say anything or discuss anything about the Sidor strike, the Ferrominera strike or the miners that are in jail. -Because of you electricity consumption is back to the 80’s in Guayana because you ruined the electric infrastructure. And you don’t talk about it. -How many of you know that in Guayana there is not asingle hospital that can provide chemotherapy or radiotherapy treatment to cancer patients. single hospital that provides chemotherapy or radiotherapy to cancer patients, but then you want to discuss this “pendejada”. -He then says ironically that he just told his daughter not to go to the market, because thanks to kicking out the americans, there will be no shortages, there will be toilet paper and the dollar will go down in price. -He then calls them stupid and imbeciles. -He then calls for a democratic solution to Venezuela’s political problem. -He then mentions all the positions, CNE, Comptroller that need to be elected and says they are illegitimate. A Chavista Deputy then answers him with ideological BS. So the terrible acts committed by the three american diplomats were visiting an opposition Mayor, visiting ONG Sumate, Bolivar branch and talking (not even shown) to Andres Velasquez and Maria Corina Machado. This in a country where Cuban military officials boss around Venezuelan ones and are present everywhere. What a joke Maduro is!